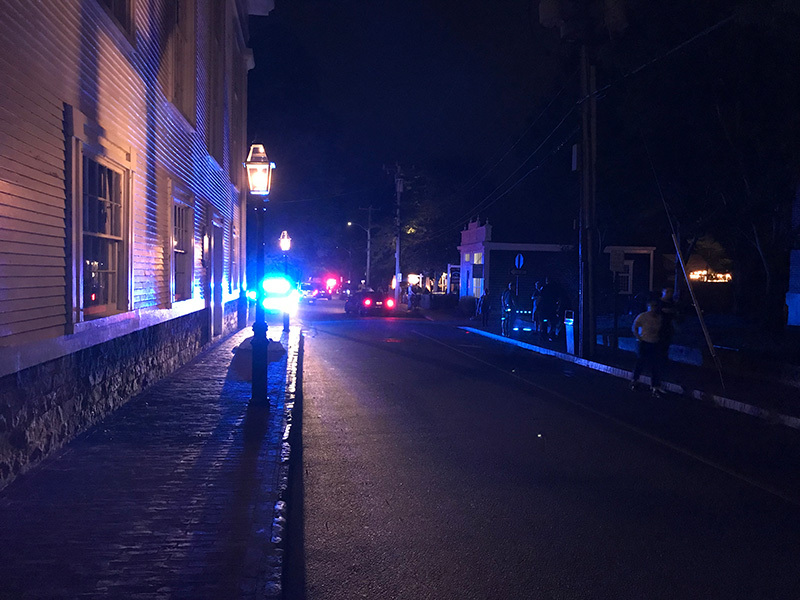 Two pedestrians were injured, one critically, when they were struck by a Vineyard Transit Authority bus Thursday night in Edgartown, according to Fire Chief Alex Schaeffer and other sources. A third person was injured when the bus came to a hard stop. The injuries occurred on Church Street, where the VTA has one of its stops outside the visitors’ center. Edgartown Police and Fire Departments, along with State Police, responded to the scene at 10:20 pm. Two of the people have been released, and a third has been taken to a Boston hospital, Police Chief Bruce McNamee said. A week after the crash, police are refusing to release any names citing the ongoing investigation. A State Police accident reconstruction team has been brought in to investigate. The crash is also on film, because VTA buses have cameras. Details of how it happened have not been released. Police interviewed the bus driver, who has not been identified, and he is cooperating. The chief said the driver passed a Breathalyzer test, and is also being urine-tested. Those results are not yet known. “It was pretty loud,” he said. The other victim lay in the road. “He was hurt, I guess, from the impact from the bus. I think he was going to be OK,” he said. Both men appeared to be in their mid-30s, he said. Alvarado recalled the bus driver rushing out of the bus. “He was nervous and shaking the whole time,” he said. McNamee said Det. Dayce Moore and a trooper from the State Police accident reconstruction team will lead the investigation. Three nurses who were nearby at the time of the accident rendered “invaluable aid” before EMS personnel arrived, McNamee said. State Police cleared the bus, which was not electric, to be repaired and return to service Friday, VTA administrator Angie Grant told the Times over the phone call. Grant also said the driver involved in the accident took a chemical test which came back negative. The driver, who was a seasonal employee, “chose to end his employment,” she said. The Amalgamated Transit Union, a labor organization that is negotiating a contract between VTA drivers and their operations manager Transit Connection Inc. (TCI), offered its sympathies to the victims of the crash in a statement Wednesday. “On behalf of VTA operators and members of the Amalgamated Transit Union, we would like to offer our sincerest sympathies to the victims involved in the Thursday, July 26th crash involving a VTA vehicle. Out of respect to the victims and their families, we will not comment on the details of this specific tragedy at this point. We feel compelled, however, to inform the public that we have warned VTA management in the past of our fear that crashes similar to this would becoming increasingly likely to occur. We believe changes can be made to prevent them, but those changes require addressing serious, systemic issues plaguing the VTA and the contractor it uses to manage the service, Transit Connection Inc. (TCI). 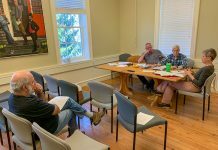 Mismanagement, mistreatment of workers, and especially a lack of proper safety precautions have created a perfect storm that will inevitably lead to more tragedies,” the statement said. Grant declined to comment on the union’s statement because she had not read it yet. 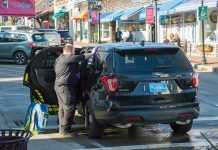 Two of the people have been released, and a third has been taken to a Boston hospital, Police Chief Bruce McNamee said. Police are not yet identifying any of the people injured. Brian Dowd contributed to this story. Story has been updated to include information from VTA and union. -Ed. The street is too dark. One would think bus stop would be more well lit. The same goes for the cross walks at Stop and Shop. Someone will be killed there eventually. Salt– the street is dark– you would think you be able to see the headlights of a bus coming at you better in the dark. if the street were lit up more , do you think they would have seen the bus easier ? obviously , they weren’t paying attention.. do pedestrians not have some responsibility for their own safety ? how can you get hit by a bus ? well, we don’t have information yet, but based on my observations of people walking around looking at their phones, I’m thinking the bus driver is not at fault– it’s a wonder this doesn’t happen every day. Walk facing traffic people– and ride your bike with traffic..
Wow, Don3….these are the first sane comments you’ve made without blaming Trump. I rarely “blame” trump for stuff- I just point out stuff he does or says.. I don’t know why, but people on vacation often walk or stand in the middle of the road. Menemsha is particularly bad. I’ve almost hit pedestrians numerous times. Often the just walk out into the road from beween 2 parked cars which are taller than them. I also see people walking around at night staring down at their phones and not looking before they step out into the road. I actually had a guy step in front of my bike on the bike path, again looking down at his phone and just darted right in front of me. It’s amazing that more people don’t get hit.